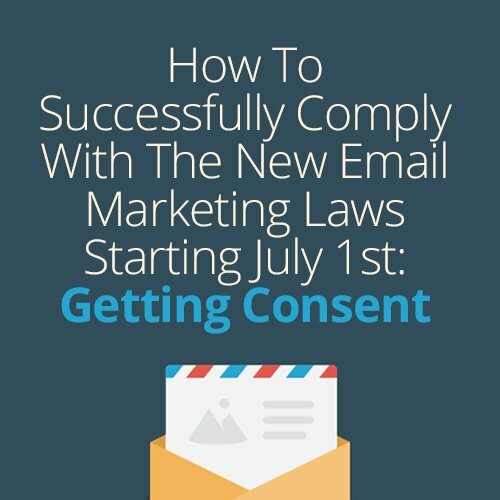 At this time, we’re going to look at some of the ways that you can successfully comply with the CASL and get consent from those that you’re doing business with- after all, you’ll need it if you want to continue sending them emails. When someone has purchased a product or service, or is a part of a business deal, contract, or membership with your company within the past 24 months. If you’re a political organization or a registered charity, and the contact has given a donation or gift, attended a meeting organized by your company, or has volunteered. When you send a professional message to a contact whose email address was given to you, or is clearly published, and they haven’t told you that they don’t want unsolicited messages. A clear, honest description of your purpose in obtaining their consent. A description of the types of messages that you’ll be sending them. A statement that the recipient of your messages may unsubscribe from your emails at any time. The name and contact information (including the physical mailing address, telephone number, email address, and/or website URL) of you or the client that’s requesting consent. You need to retain a record of all your consent confirmations. When requesting consent, you cannot pre-fill checkboxes to suggest consent. Consent can only be valid if the contact checks the box themselves. All of your sent messages to contacts need to include your name (or the person on whose behalf you are sending the messages,) and your physical mailing address, along with your telephone number, email address, and/or website URL. All email messages sent after you receive consent need to include an easy to find unsubscribe mechanism. They also need to be processed within 10 days. We recommend that you put a fair amount of your resources into asking your clients for their consent as soon as possible, since any consent requests sent after July 1, 2014 will technically be breaking CASL law. If you would like to learn even more about implied and express consent, you can check out the CRTC’s detailed FAQ by clicking here. Mailchimp has actually posted a very informative guide that can help their users effectively comply with the CASL– click here to read it. This entry was posted in Online Marketing and tagged Canadian Email Marketing Laws,Canadian Marketing Laws.,Canadian Online Marketing Laws,CASL,CASL Email Marketing Laws,CASL Email Markteing,email,email marketing,Email Marketing Laws,Marketing,Marketing Laws,Online Marketing,Online Marketing Laws,Social Media,Social Media Marketing on June 24, 2014 by ReferLinks Online Marketing.